In this series of articles, I will be exploring each of the six basic woodturning tools we have already discussed throughout the beginners' series. I will be looking at how to sharpen each tool and also possible variations available. 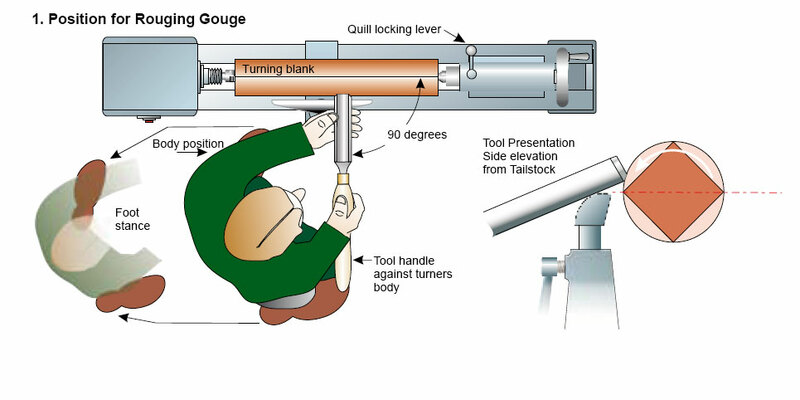 This time, I will taking a detailed look at the spindle rouging gouge. Before we can turn any wood, we need to know how to hold the tool correctly and how to mount the wood on the lathe. To begin with I would recommend a piece of wood 200mm (8in) x 75mm (3in) or 200mm (8in) x 50mm (2in) which will be used for experimental purposes to help build an understanding and confidence with the turning tools. 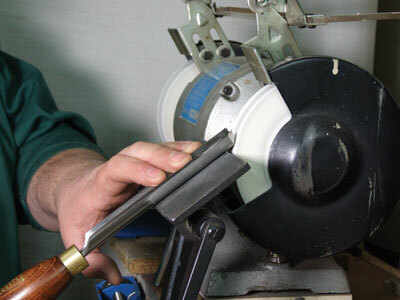 The mounting method used will apply to most of the basic tools, with the exception of the bowl gouge and bowl scraper. The spindle roughing gouge is 'U' or 'C' shaped and square ground to roughly a 45 degree bevel. It is usually forged, but in recent years we have seen the introduction of round bar versions, which operate in the same way but they are more stable in use. 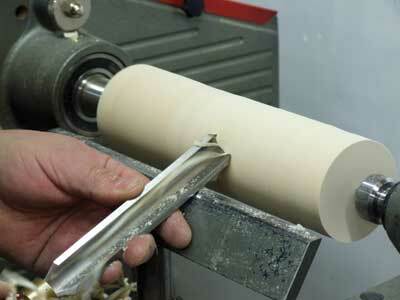 The spindle roughing gouge is solely used for reducing stock to round whilst mounted between centres. It is the very first tool that should be used by any beginner and has many applications for spindle work. It will teach a basic understanding of all other tools but should only be used as the name suggests - when turning spindles. 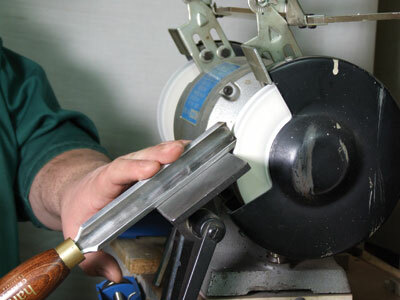 This is when the wood is mounted between centres or the grain of the wood is running parallel with the bed of the lathe, but never on faceplate or bowl work. The standard tool is tanged and as a result will need to be treated with some respect. If your technique is too aggressive the tang will bend or at worst, even break. Apprentice turners would only be allowed to use this tool and only when mastered, maybe many months later, should they be allowed to progress to another. This may seem a little boring to a new woodturner but obtaining shavings/chippings at this stage is enough reward. With wet wood you can see continuous streams of ribbon-like shavings flying away from the tool. The more you practise, the better you will understand the technique. 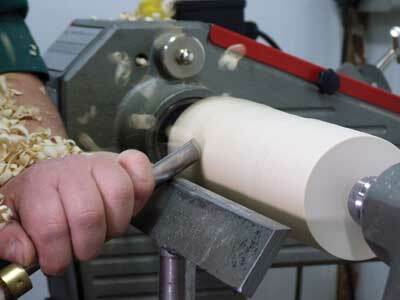 There is no substitute for time spent at the lathe. Remember to use the marker pen technique to check for correct bevel presentation before grinding/sharpening your tools. Apply only a light pressure against the wheel - let the grinder do the work. Do not force the machine it or will slow down, or even stall. When learning to sharpen any tool start with the machine turned off. Take a dry run before turning on the power and ensure to get the presentation correct before taking one light pass to sharpen the tool. The spindle roughing gouge should be ground square across the front and to a bevel angle of 45 degrees. It is one of the easiest tools to sharpen. With freehand sharpening, set the tool on the toolrest square to the face of the wheel, lower the handle and present the heel of the tool first, lifting the handle until the bevel is in full contact. At this point the sparks should appear at the front edge of the tool. Then, gently rotate the tool to the left and when at the end, roll it back to the right in one smooth fluid movement, applying only enough pressure to keep the tool on the wheel and in place while sharpening it. There needs to be plenty of space around the grinder or machine to sharpen your tools. 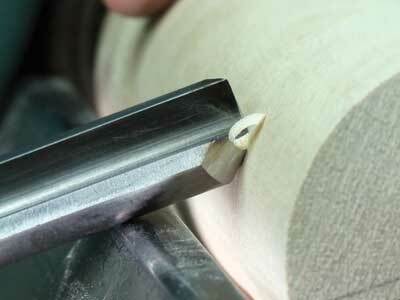 Remember, practice is all that is needed to achieve the perfect bevel when sharpening freehand. 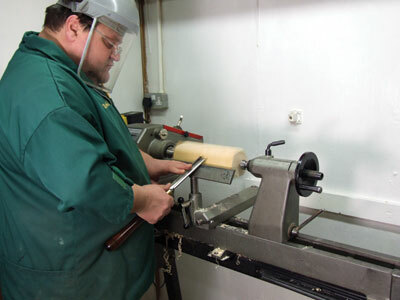 - Set the tool flat on the toolrest and position the bevel at the correct angle to the grinding wheel. (I always do this with the flute facing vertically). - With the tool ready, turn on the grinder and apply to the wheel while rotating the tool to the right. - Now, rotate the tool to the left (this motion should be made as smoothly as possible to produce an even and constant width bevel). One or two passes are all that is required when sharpening the wings. The tool needs to use the full width of the wheel and requires sliding back and forth to produce a straight side. The three surfaces now need be blended together in one flowing movement. Sharpening jigs vary from manufacturer to manufacturer, and the teqniques used or required will vary according to the jig used. Refer to the manufacturers handbook for Information. Jigs however will give a more consistent approach and angle time and time again. The cost implications are far outweighted by more consistent results. 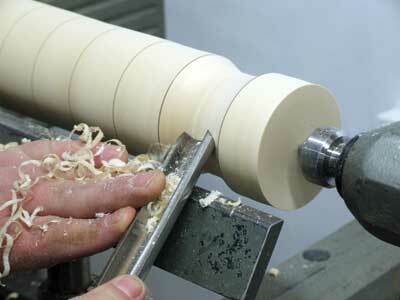 When beginning turning, many people struggle to stand correctly at the lathe. You should stand with your feet a shoulder width apart to allow you to become centered and most importantly, balanced with a balanced position (you should be able to turn with a minimal amount of movement). The movement which occurs is called "the woodturners dance/sway" and this term was coined by Del Stubbs. Fluid movements make fluid shapes - if you struggle with this forget about trying and instead concentrate upon the tool and what it is doing and it will become much easier. 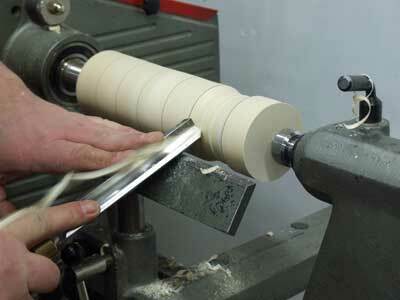 - Put safety visor on and position your feet correctly and at a slight angle to the lathe bed. - Hold the tool in against your body with the handle low and flute facing the ceiling. (This is the neutral presentation). - Slowly lift the handle until there are small chippings/shavings appearing over the front of the cutting edge. - Rotate the tool in the direction you wish to travel with the cut (towards the tailstock) and gently travel along the blank with the handle trailing. - Continue working from the centre to both ends of the blank until the blank approaches round. As work progresses check the blank is still tight between centres and if required, re-tighten the tailstock. 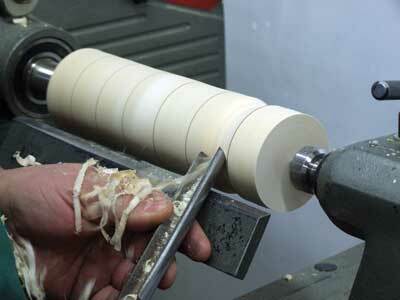 - Use the back of the tool against the rotating blank to check for roundness. If the noise produced is a knocking sound, or a rattle, then the blank is still not quite round and requires further material to be removed. - Reduce the blank as far as possible to make it round and parallel. - To achieve a better finish, turn the tool on its side and use the wing to make a planning cut along the cylinder (the key is to keep the corner of the tool just out of the wood, if it goes into the wood the cut will stall and create feathers). If you get it right it will produce a fine finish directly from the tool. When presenting the tool to the timber there is a fine line between cutting and not cutting. The phrase "rubbing the bevel" is somewhat misleading as it implies that all the bevel must be in contact with the wood - this is not so and can lead to further problems. 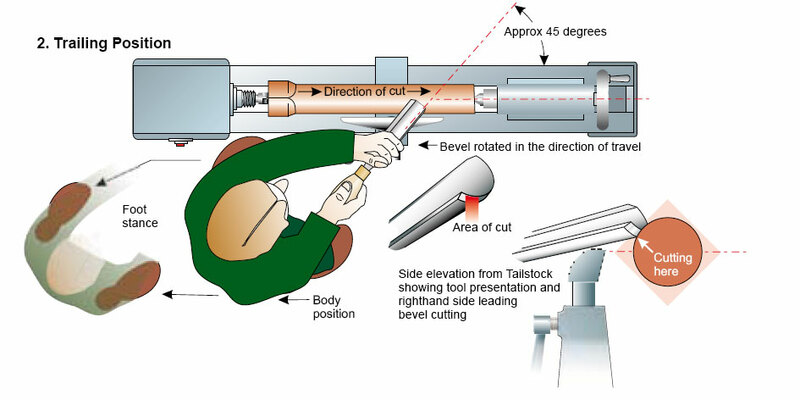 The bevel needs to be lifted to start the cut and the greater the gap at the heel of the tool, the more aggressive the cut will become, and will create a submarine effect at the point the tool is cutting efficiently. 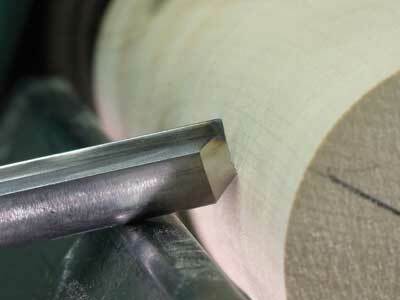 Up close inspection of your tools after a period of turning will usually reveal evidence of the amount of bevel that has rubbed immediately behind the bevel edge of the tool. The amount of true bevel contact is not as much as many think. This is a common misconception. - Here is a close-up image of the neutral position at the point before the cut occurs. - Here, the tool is beginning to cut. To check this, rotate the blank by hand to see what is happening at the sharp end of the tool. The greater the gap at the back of the bevel (the heel) the more aggressively the tool will want to cut. Don't be greedy - more sensitive cuts are far better than fewer, more aggressive cuts. - Incorrectly presented bevel position - if this tool was presented there is no sensitivity to the wood. Its presentation is far too aggressive and will just tear lumps from the blank thus producing a poor quality finish from the tool. This is a basic exercise to help the beginner develop a feel for the tool. First turn the blank to a cylinder and mark six equally spaces lines - between these we will turn coves. - With the tool at a slight angle to the right, lift the handle to the point it is beginning to cut and swing the handle to the right. - Repeat the above but swing to the left. - Blend the right and left surfaces together. 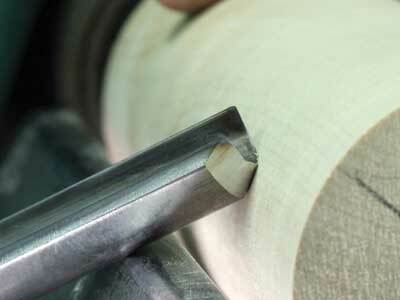 When picking up a turning tool and presenting it to the timber, the tool must always be in contact with the toolrest. This also acts as a guard between the turner and the blank. When holding a turning tool, you require enough grip to be in control, but not so much that the hand hurts after a short session (if your knuckles are white you are gripping the tool handle far too tightly). The hold needs to be relaxed yet enough to allow full control and sensitivity. There are two basic ways to hold a turning tool; overhand or underhand. By using a combination of the two you will have the versatility to cover large and small projects. You can hold the tool at the end of the handle or at the top (the fat part of the handle behind the feral). This can also be called a short grip and I find this gives far greater control. - This is the over-handed method and is a very powerful and positive way to hold the tool. I usually use this grip when starting to rough turn a project as it offers much less feedback. - This is the underhanded method and will provide much greater control and sensitivity when turning finer spindles, for example. "Rotate the tool in the direction you wish to travel with the cut"